Buffalo Wedding DJ Johnny K’s goal is to make your wedding day as wonderful as you imagine it to be. Music plays a major role in conveying your love for one another, your families and guests. We meet with you in person (or consult by phone) to insure the music you select reflects your ideals. Experienced Professionals – DJ Johnny K a “Buffalo Wedding DJ” is a professional mobile disc jockey that enjoys entertaining people. Johnny K has many years of extensive experience in the music industry as a disc jockey, musician and music retailer. 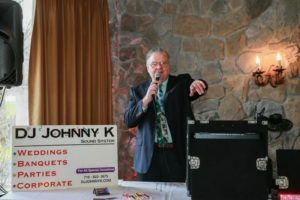 Johnny K was elected seven times for office of President of WNYMEA (Western NY Mobile Entertainers Alliance), member IDJA (Independent Disc Jockeys Association), South Buffalo Business Association, Chamber of Commerce (Past Vice Chair), Save our Libraries, P&BA and the Buffalo Wedding DJ Association. A lifelong Buffalonian, Johnny K is very active in the Buffalo, Rochester and WNY Community. 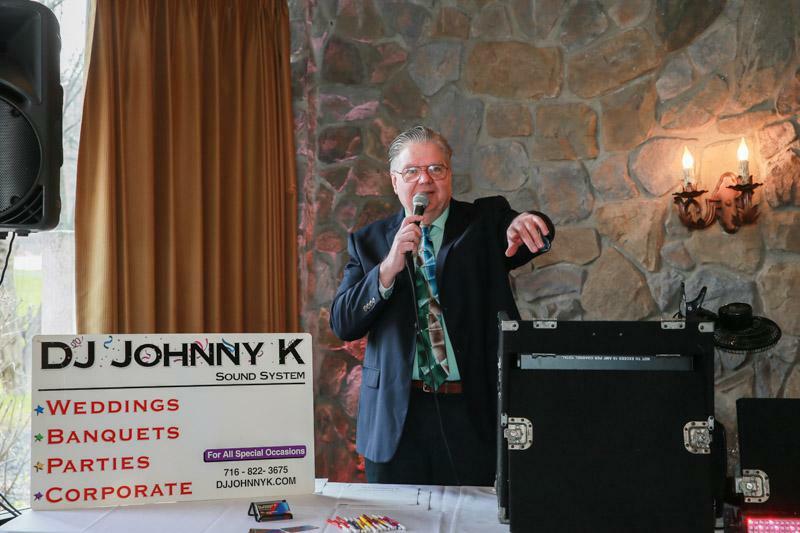 DJ JOHNNY K is your “Buffalo Wedding DJ” Sound System! Fill out the check availability form and DJ Johnny K will personally contact you to provide Buffalo Wedding DJ prices and options! Click here to check our availability! Party Time! – Many brides tell us they want a fun reception, but don’t want a three-ring circus. Our experience with reading audiences and listening to clients helps us determine the right amount of interactivity for you and your guests. With our extensive musical knowledge and selection, we meet your preferences without relying on songs you’ve heard at every other wedding reception. We play only songs that are appropriate for family events. Your guests will have a great time without embarrassment. Professional Planning – Planning your event is crucial to its success. We use a detailed planner. We also call you with our tentative event itinerary to discuss the flow of your reception. Finally, we provide copies of your itinerary to your venue manager, caterer, photographer, videographer, etc. We are flexible and adapt well to unforeseen circumstances. Our professional announcements insure that your vendors serve you in a timely manner, and that your guests enjoy all of your reception events. Musical Magic – From background dinner music to your last dance, we carefully consider the music we play. Music lists for your special events include Introductions, First Dance, Father/Bride Dance, Mother/Groom Dance, Bridal Party Dance, Cake Cutting, etc. We play your requests and carefully avoid songs you do not wish to be played. We will be glad to assist you in any of your selections from our extensive digital collection of music. Outstanding Sound – The best music and Master of Ceremonies are incomplete without a quality sound system. Our standard system is made up of finest sound equipment including Mackie, Pioneer, and Sony. Best Buffalo Wedding dj sound! Colorful lighting effects including a mirror ball, laser, LED and other effects are available upon request. Call Johnny today at (716) 472-9898 for a “Special Lighting Offer”. Appearance Is Important – We wear proper formal attire and shoes for your wedding. Our equipment is arranged in like manner. We use a black carpeted, skirted table and a matching facade to hide all wires. Our sound and lighting system is set up in neat order and enhances your reception with simple elegance. Communication Is Key – For this important day, you should be comfortable with all of your wedding vendors. We meet with you before booking your wedding at no obligation. We can meet in our office that specializes in wedding receptions. We are a full-time disc jockey service and offer day or evening appointments. Over 80% of our customer base are brides and their families. Because our business is centered around wedding receptions, our music, lighting, and sound system is designed with weddings in mind. Event Coordination – With experience in all types of wedding receptions, we can help you plan your reception and select your music. We have suggestions for dances like a First Dance, Father/Daughter Dance, Mother/Son Dance, etc. We can also help you plan your reception events such as the cake cutting, toasts, garter and bouquet tosses, etc. We will also coordinate with your photographer, caterer, hall manager and others to make sure everyone knows what is going on and when. Guests Get Involved – As your reception begins, we welcome your guests and family as they await your arrival. Then, we are standing by, ready to announce you and your spouse when your arrive. While your guests dine, we play light and tasteful music. As the evening continues, we guide you and your guests through all your special dances and events. Throughout the evening, you will be treated to some of our most memorable events. We will make your reception the most memorable and enjoyable event your guests have ever attended! Buffalo Wedding DJ for all of WNY entertainment! A Special Touch – From dramatic introductions to special send-offs, we add extra special touches you and your guests will remember. These may include the Honeymoon Dance, Anniversary Dance, Matchmaker’s Dance, special props for interactive dances, a bubble machine, intelligent lighting, mirror ball, and even a laser show! Some of these may be subject to venue approval, and all are subject to your approval. Music Library – We have a comprehensive music library for all tastes and ages. We have music from every era and style. From Big Band to Top 40 hits of today… and everything in between. Click here to view our current list of top hits. We will always play the requests of the bride and groom, as well as your guests (if appropriate). We’ll play the greatest party songs, most romantic slow dances, most popular Top 40 hits and more. And, if you have a special song that you MUST have at your reception that we don’t have, we’ll make an effort to get it! Experience – We actively solicit comments from our customers after each event. Click here to see some of these comments. If you are interested in further references, we will be glad to provide them. Your experienced Buffalo Wedding DJ! Competitive Prices – Although weddings and receptions become more and more expensive, the cost of your DJ will still work out to be one of the least expensive parts of your day. Your DJ, however, will have the greatest effect on how your reception turns out. When the lights go down, DJ Johnny K Sound System will help you and your guests have a great time! Various pricing packages are available to help you meet your budget. We make sure our customers always get more than what they pay for! Click here to request availability for your wedding ceremony and/or reception. Or call us at (716) 472-9898! A Buffalo Wedding DJ for all seasons! Your Buffalo wedding dj service! Buffalo Wedding DJ for all seasons! Your Buffalo wedding dj service! Buffalo Wedding DJ for all seasons! Dear D.J. Johnny K., Thank you... The crowd loved the music, and the dance floor was continuously utilized. It meant a lot to Ann that you remembered her and the "duck dance"! Thank you so much!